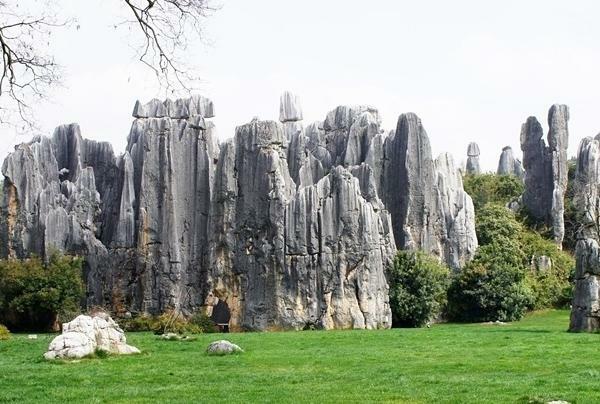 With an area of 350 square kilometers, Stone Forest is located in the Shilin Yi Autonomous County of Kunming, 78 kilometers from Kunming. It is composed of Stone Forest Scenic Area, Heisongyan (Nangu Stone Forest) Scenic Area, Feilong Waterfall (Dalian Shui) Scenic Area, and Changhu Scenic Area. About 300 million years ago, Stone Forest was a vast ocean. After a long geological evolution, it finally formed an extremely precious geological relic, covering many types of karst landforms on the earth. The Shilin Stone Forest is home to wildlife and wild plants, such as Yunnan camphyor tree, Chinese plum yew, beech, Mangnolia officinalis, Eucommia ulmoides, Neocheiropteris palmatopedata, pangolins, civets, muntjacs, eagles, pheasants, Garrulax canoruses, woodpeckers, Lady Amherst’s Pheasants, magpies, hares, squirrels, toads, lizards, etc. Lizi Yuanjing Hill is dotted with strange stones. There are no tall trees there. The rock paintings present primitive religious content – figures of the primitive men, beasts, the moon and stars. Strange Wind Cave is not large. The diameter is about 1 meter. During the rainy season, the sound of the cow’s gasping is always heard in the cave. At Zhiyun Cave, you could admire stalactites, stalagmites and stone pillars. The cave is around 400 meters long, 5 – 30 meters tall, and 3 – 15 meters wide. Some stalactites look like sitting Buddhas, grapes, camels, trees and the like. Stone Forest has been a settlement of Sani People for hundreds of years. Every lunar 24th of June, the Torch Festival is always held at the Stone Forest by them. At that time, you will appreciate the fierce bullfighting and try the authentic local food. As it always takes several hours to explore the forest, it is recommended that you visit the Stone Forest in the morning. The best months to visit are from March to November. There are direct buses from Kunming Changshui Airport, and Kunming East Bus Station (昆明东部汽车站) to the Stone Forest. You could take it or rent a vehicle to the forest. Please wear comfortable hiking shoes as it will take a long time to explore the forest. The forest offers English interpretation service, and the pricing is 200 NCY per person one time. The service time is between 2 and 2.5 hours. Please take enough drinking water with you at the forest. It is easy to get lost at the forest. Interested in visiting the Shilin Stone Forest on a Tour? Wendy Wei Tours offers a variety of different packaged tours as well as custom tours including the Shilin Stone Forest, among other attractions and destinations. To find out more, please visit our Tours page or Contact Us directly to find out more.